Property 10: Bed & Breakfast in the green heart of Umbria and close to the sights. 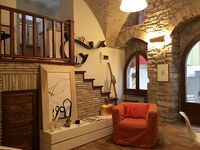 Property 14: Find your peace and yourself in the country house of Acquaviva. Property 26: Romantic Apartment "From Wand"
Property 34: Beautiful Rural Apartment W/ Stone On The Wall And Ancient Original Furniture!